Selling your home in the spring is best for most homeowners. There’s no doubt about it but the market is blooming with flowers and buyers … two pluses for you! Starting in March and going through June, the real estate market is in full force throughout the DC metro area. Just about anyone who is looking for a home is hitting open houses. You hear about “location, location, location” when it comes to real estate. But “timing, timing, timing” should be up there as well. Spring is a much better time of year for most buyers to start focusing on moving. It’s that simple. Most buyers want to get settled into a new home before a school year begins. Buying in the spring and having the summer to get adjusted appeals to many families. Even those without kids find this time of year better for taking time off of work to move, etc. With the lull of summer approaching, it means many buyers can catch their breath after the rush of looking for a home and moving. This makes sense—no one wants to be moving during the holidays, so now everyone is focused on making this happen. And because of this more convenient timing, more buyers are out there looking at homes in the spring. And more buyers mean more foot traffic to your home and more opportunities for you to sell your home in a timely manner. Our clocks spring forward in March and the days get longer but in a good way. More sunlight and more time for buyers to go out and about looking at homes … such as yours. Buyers tend to hibernate during the winter months and prep themselves for these warmer days to look at homes. Who wants to look at homes in the dark after work or when it’s freezing and snowy all weekend? You’ve got a whole pool of potential buyers who’ve done their homework, got their financing set, and will use these longer days wisely each weekend. Plus house hunting in warm but not too hot weather is just much more fun and productive than other times of the year. Everyone is in a better mood and dreaming of a new home like yours! You have to admit it but your home looks its best in the spring. Right? If you have a yard with flowers, azalea bushes, dogwood trees, and green grass … why wouldn’t a buyer fall in love with it! That’s why sellers take advantage of this “free” bonus of better curb appeal in the spring. You always want to highlight your home’s best features and draw in buyers who can imagine themselves living there. Your patio, deck, porch, balcony, or yard can look so inviting right now than at other times of the year. More buyers means more competition from other buyers … which means more chances for bidding wars and, ultimately, a higher sales price for you. And springtime is when these bidding wars tend to happen more often than during any other season in real estate. Despite the fact that inventory is usually at its highest, prices are at their highest too. Since prices tend to be higher and there are more closed sales during the spring, your agent will have access to more comps or comparables that better reflect the current market (and your home). When there are fewer sales at other times of the year, your home could get matched with a bad comparable. Even though you’re focused on selling your home, you’re probably also planning on moving to a new home. All the reasons about being more convenient, longer days, and even higher prices translate to your own experience as a buyer as well. Buying and selling can be stressful and chaotic, and you want to do it right in the shortest amount of time if possible. And this is another reason why spring is best for homeowners who want to sell and buy. 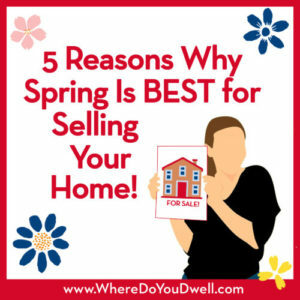 Springtime offers you the chance to sell your home quickly for a higher price, which can help with the purchase of your next home. Plus, the timing is more flexible for many families who are juggling buying and selling at the same time. Reach out if you have any questions about timing the sale of your home for this awesome spring selling season! We can help you plan it all out so we nail the perfect timetable for your own big move.